ERCP image showing the biliary tree and the main pancreatic duct. The bile duct is green like the gallbladder, because of bile stains. The biliary tree (see below) is the whole network of various sized ducts branching through the liver. The path is as follows: Bile canaliculi → Canals of Hering → interlobular bile ducts → intrahepatic bile ducts → left and right hepatic ducts merge to form → common hepatic duct exits liver and joins → cystic duct (from gall bladder) forming → common bile duct → joins with pancreatic duct → forming ampulla of Vater → enters duodenum. Inflation of a balloon in the bile duct causes, through the vagus nerve, activation of the brain stem and the insular cortex, prefrontal cortex, and somatosensory cortex. Blockage or obstruction of the bile duct by gallstones, scarring from injury, or cancer prevents the bile from being transported to the intestine and the active ingredient in the bile (bilirubin) instead accumulates in the blood. This condition results in jaundice, where the skin and eyes become yellow from the bilirubin in the blood. This condition also causes severe itchiness from the bilirubin deposited in the tissues. In certain types of jaundice, the urine will be noticeably darker, and the stools will be much paler than usual. This is caused by the bilirubin all going to the bloodstream and being filtered into the urine by the kidneys, instead of some being lost in the stools through the ampulla of Vater. Jaundice is commonly caused by conditions such as pancreatic cancer, which causes blockage of the bile duct passing through the cancerous portion of the pancreas; cholangiocarcinoma, cancer of the bile ducts; blockage by a stone in patients with gallstones; and from scarring after injury to the bile duct during gallbladder removal. Biliary drainage is performed with a tube or catheter (called a biliary drain, biliary stent or biliary catheter) by a surgeon or, commonly, an interventional radiologist. It can be used to relieve a blockage in the bile duct, either permanently or as a temporary solution before definite treatment such as surgery. The drain can be placed percutaneously through the liver, with the procedure then being called percutaneous transhepatic biliary drainage (PTBD). This can additionally be performed as part of a percutaneous transhepatic cholangiography, then a form of interventional radiology. A biliary drain can also be used to take bile samples for diagnostic workup or disease monitoring, as well as providing a route of administration for medical substances. In infants with biliary atresia, hepatoportoenterostomy is an alternative method of providing bile drainage. Cholangiocarcinoma or bile duct cancer is a form of cancer that is composed of mutated epithelial cells (or cells showing characteristics of epithelial differentiation) that originate in the bile ducts. Cholangiocarcinoma is considered to be an incurable and rapidly lethal cancer unless both the primary tumor and any metastases can be fully removed by surgery. No potentially curative treatment exists except surgery, but most people have advanced stage disease at presentation and are inoperable at the time of diagnosis. Section across portal canal of pig. ×250. An intraoperative cholangiogram, which is an X-Ray of the bile ducts during a laprascopic cholecystectomy. ^ Kuhn, J. P.; Busemann, A.; Lerch, M. M.; Heidecke, C. D.; Hosten, N.; Puls, R. (2010). "Percutaneous Biliary Drainage in Patients with Nondilated Intrahepatic Bile Ducts Compared with Patients with Dilated Intrahepatic Bile Ducts". American Journal of Roentgenology. 195 (4): 851–857. doi:10.2214/AJR.09.3461. PMID 20858809. 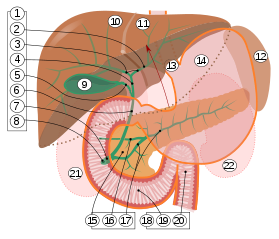 Wikimedia Commons has media related to Bile duct. This page was last edited on 1 March 2019, at 05:47 (UTC).